Win our September Entertainment Prize Pack! Enter to win our September Entertainment Prize Pack! -Must fill out short entry form. Leave a comment at the end of this post to be entered twice. Those who leave a comment without filling out the entry form will not be entered. -Contest ends Wednesday, Sept 15, 2010 at 11:59pm EST / 8:59pm PST. Winner will be notified by email and/or phone. If contest winner does not provide a valid mailing address by the specified time, another winner will be chosen. 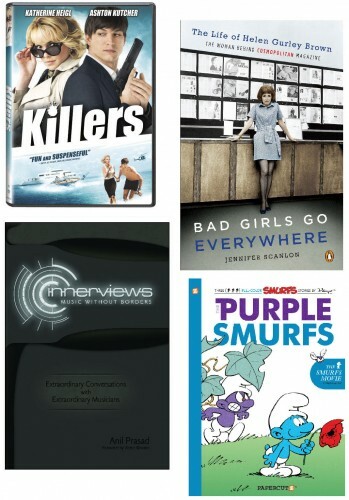 Awesome, free dvd & books, how can you go wrong? My birthday is in September and I would enjoy the entertainment! Such a lovely giveaway! I want theKILLERS dvd for my collection. I keep hearing it is so good. Purple Smurf’s…is that even legal??? I want to see that movie!! Stuck at home! Would love to watch a new dvd and get some new reading material! I hope I win, love to spend my weekends watching a good dvd with the boyfriend! Would love this prize pack! I love the smurfs!! This would be wonderful!! Thanks! What a great prize pack. Thank you for the opportunity. It is a great well thought out prize pack. My hubbys bday is in September, he would love this! suelee1998 @ gmail.com I love the smurfs too! Dvd and books for everyone in the family.